what has been done before hasn't worked." 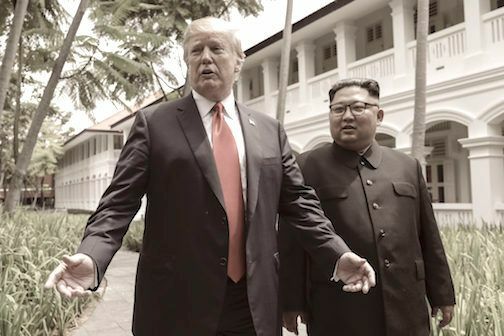 SINGAPORE (AP) -- Embarking on a self-described "mission of peace," President Donald Trump puts his seat-of-the-pants foreign policy to its toughest test yet as he attempts this week to personally broker an end to North Korea's nuclear program in talks with Kim Jong Un. SINGAPORE (AP) ? 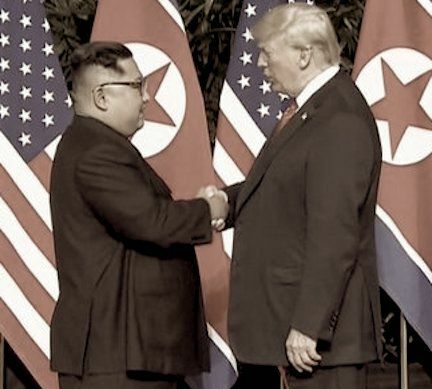 President Donald Trump and North Korea?s Kim Jong Un kicked off a momentous summit Tuesday, with Trump declaring the two would have a ?great discussion? and Kim saying they had overcome ?obstacles? to get to this point. visit the White House at the 'appropriate' time." After summit, Trump announces halt to US-SKorea ?war games? SINGAPORE (AP) ? President Donald Trump and North Korea?s Kim Jong Un concluded an extraordinary nuclear summit Tuesday with the U.S. president pledging unspecified ?security guarantees? to the North and Kim recommitting to the ?complete denuclearization of the Korean Peninsula.? Both leaders expressed optimism throughout roughly five hours of talks, with Trump thanking Kim afterward ?for taking the first bold step toward a bright new future for his people.? Trump added during a free-flowing news conference that Kim has before him ?an opportunity like no other? to bring his country back into the community of nations if he agrees to give up his nuclear program. Trump announced that he will be freezing U.S. military ?war games? with its ally South Korea while negotiations between the two countries continue. Trump cast the decision as a cost-saving measure, but North Korea has long objected to the drills as a security threat. The pair promised in the document to ?build a lasting and stable peace regime? on the Korean Peninsula and to repatriate remains of prisoners of war and those missing in action during the Korean War. Language on North Korea?s bombs was similar to what the leaders of North and South Korea came up with at their own summit in April. At the time, the Koreans faced criticism for essentially kicking the issue of North Korea?s nuclear arsenal down the road to Tuesday?s Trump-Kim summit. Trump and Kim even directly referenced the so-called Panmunjom Declaration, which contained a weak commitment to denuclearization and no specifics on how to achieve it. .... The meeting was the first between a sitting U.S. president and a North Korean leader. Aware that the eyes of the world were on a moment many people never expected to see, Kim said many of those watching would think it was a scene from a ?science fiction movie.? pretty good length. We'll be doing something on it.'" with an unscheduled signing of documents after their summit in Singapore on Tuesday. The two leaders appeared in a room decorated with flags of both countries for the signing ceremony. ?We?re both very honored to sign the document. Thank you,? Trump said shortly. that the two leaders had ?left the past behind.? ?The world will see a major change,? he said. ?I would like to express my gratitude to President Trump to make this meeting happen.? The pair signed documents which vowed to establish diplomatic relations between the two countries with a commitment from North Korea to denuclearize the Korean peninsula. The president spoke briefly to reporters after the handshake, affirming that he would meet with Kim ?many times? saying that he had a ?great personality? and was ?very smart.? ?Good combination,? 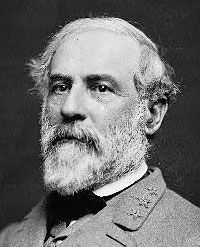 he added, describing him as ?a very worthy, very smart negotiator. ... We had a terrific day and we learned a lot about each other and our countries,? he said. When asked what he learned about Kim, Trump replied, ?I learned that he?s a very talented man. I also learned that he loves his country very much.? they always want to forget and avoid the fact the NK kid was schooled in switzerland .. . He is the heir poised to become the next leader of rogue state North Korea. But a probe into the school days of Kim Jong Un - youngest son of dictator Kim Jong Il - proves he is little more than an academic failure who squandered his education playing computer games and basketball. ... But the world will have to see whether his prolonged exposure to the west and its values during his school days in Switzerland have imbued him with any democratic values that might bring his decrepit and starving country back into the international fold after years of isolation. But the signs are not good. Despite having thousands of pounds lavished on his education at a top private school in Switzerland, he didn't leave with even the equivalent of a single GCSE. When he was just 15 his father took him out of the costly International School Of Berne, where fees now cost around ?16,000 a year. He moved him to a nearby state school to save money but he was quickly put in the lower tier in class. The North Korean Embassy in Berne sent back reports on his son's friendships and influences to his father and intelligence chiefs back in North Korea. Joao said: 'We spent nearly every afternoon with each other. He often invited me back to eat. He had a private chef who cooked whatever he wanted. This is the English version of the video "trailer" that President Donald J. Trump showed Chairman Kim Jong Un during their historic summit on 6/12/18. This is a rip from the official White House press conference live stream, where they showed the video to reporters before the President took questions. ?We will be stopping the war games which will save us a tremendous amount of money, unless and until we see the future negotiation is not going along like it should. But we?ll be saving a tremendous amount of money, plus I think it?s very provocative,? Trump said at a press conference in Singapore. ?Under the circumstances that we are negotiating a very comprehensive, complete deal, I think it?s inappropriate to be having war games,? he said, using North Korea?s preferred description of the military exercises. But Trump said the U.S. would not reduce the presence of some 32,000 U.S. soldiers in South Korea.